Creativity is the pulse of life! To be alive is to be creative and connected to the rhythms of the natural world. Through nature and art, we can deepen into our own embodied goodness and remember ourselves as part of a larger story. We each have the capacity for creative play and expression. Slipping into the beauty of nature can help us relax and expand our imagination. Whether you see yourself as an artist or not, this retreat is for you! 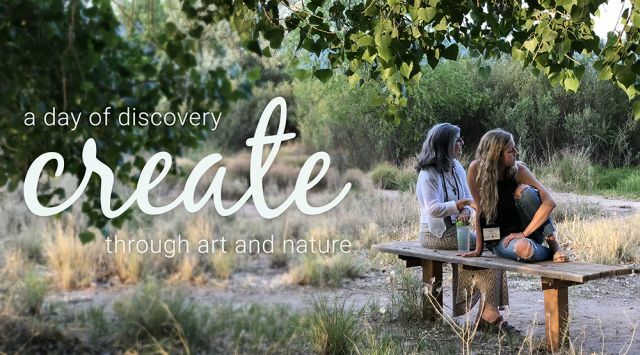 Join us for a day of freedom to play with art and to be among the trees in beautiful Monrovia Canyon as we listen for the wisdom of our deepest selves and connect to the love of God that pulses in all things. Discover the gifts of this wild place as it speaks to the truths of your own wild heart. Art is the language of the soul. The creative process is non-linear and exploratory, much like the spiritual life. By making space to create, we are also listening to our deeper experience and being present to whatever wants to emerge from within. Art helps to cultivate playfulness and freedom, increasing our overall sense of wellbeing. Nature inspires. Nature calms. Nature heals. Our very lives spring from and are sustained by the rhythms of the natural world. Taking time to be in nature reduces stress, expands creativity, and increases our overall sense of wellbeing. How did you hear about our fall retreat? We appreciate your feedback and insight. In order to make our programs available to as many women as possible, we invite women with financial constraints to volunteer in partial payment for events. Sometimes we have funds to offer a full scholarship. We don't want anyone to miss out due to finances. So please make your need known. To donate to the scholarship fund, go to our donate page and write "CREATE" in the box provided.